DIP Pin Type: Wire Wrap Pins (0.64 mm square)Machine Pins (0.45 mm round) (+$1.00) What's this? DFN-14 (4.0 x 4.0 mm body width, 0.5 mm pin pitch) to DIP-18 (600 mil body width, 0.1" pin pitch) surface mount adapter. PCB dimensions: 1000 mils x 900 mils x 62.5 mils (25.4 mm x 22.86 mm x 1.6 mm). PCB construction: FR-4 UL94V-0. 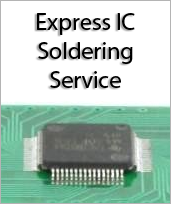 PCB operating temperature range: -40C to +130C. PCB reflow maximum temperature: +260C. PCB Assembly standard: IPC-A-610 Class II. Top side of board fits surface mount footprint. Bottom side of PCB has pads for two single row surface mount vertical headers. This board uses our surface mount male vertical headers, wire wrap or machine pin (selectable above), which are included. Wire wrap pin P/N: HDR100IMP40M-G-V-SM. Machine pin P/N: MPH100IMP40M-G-V-SM. 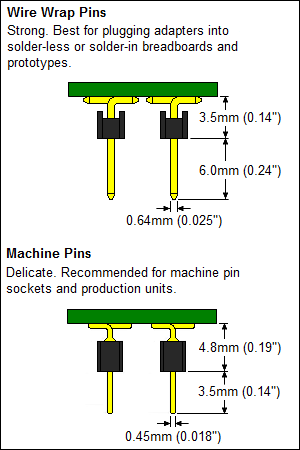 The pin rows are held the correct distance apart (either 0.3" or 0.6") using an assembly helper PCB, which comes standard with all orders where the "Unassembled, Pins Included" option is selected.